North American vanguard musical composer, anarchist. Ancient Rome: CIRCENSIAN GAMES in the Roman Circus, originally a one-day event of athletic competitions which grew to a week-long festival with many entertainments. International: BE LATE FOR SOMETHING DAY. Officially sponsored by the Procrastinators' Club of America, which protested the War of 1812 in 1967. The official news release for this year's observances has yet to be issued. what you can do the day after tomorrow." 1568 -- Tommaso Campanella lives (1568-1639), Italian utopian author of The City of the Sun (1602), just after he was condemned to life imprisonment for sedition & heresy. A "hero" of Russian Revolution. 1569 -- Painter Pieter Brueghal the Elder dies. 1750 -- Scottish poet Robert Fergusson lives, Edinburgh. A leading figure of the 18th-century revival of Scots vernacular writing & chief forerunner of Robert Burns. Though he also wrote in English, his Scots poems — racy, realistic, wittily descriptive, & humorous — have greater impact on writers like Burns. 1774 -- Painter Kasper David Friedrich dies. 1791 -- Masonic conspirator, composer Wolfgang Amadeus Mozart dies, Prague. 1793 -- France: Revolutionary government begins the Terror: "Let us institute terror as the order of the day." 1794 -- France: Radical democrat Jacques Roux is arrested. 1831 -- Naval Drip? : Charles Darwin is interviewed by Capt. Fitzroy of the Beagle for the position of ship's naturalist; Fitzroy almost rejects Darwin because of the shape of Darwin's nose. 1859 -- Our Nig by Harriet Wilson is published. The first novel published in the US by an African-American woman. Lost to readers for years until reprinted with a critical essay by noted African-American scholar Henry Louis Gates, Jr. in 1983. 1862 -- US: Lee crosses the Potomac & enters Maryland. 1863 -- US: Bread riots in Mobile, Alabama. 1869 -- Switzerland: Basle Congress of International opens. Michael Bakunin appears for the slugfest, the communists (Bakuninists) opposed to the collectivists (Marxists). "I do not want merely the soil to become general property, I want all wealth to be the same! There must be a universal social liquidation — we must have the abolition of the State..."
1870 -- France: Victor Hugo is hailed publicly in Paris upon return from banishment on Guernsey in the Channel Islands, where he wrote Les Châtiments & Les Misérables (Hugo spent about 50 pages describing the sewers of Paris). Hugo returned to France after the collapse of the Second Empire. He was elected to Parliament in October. On December 1 he obtains the release of Louise Michel. 1872 -- Netherlands: A commission to the investigate the Bakuninist Alliance (anarchist) meets today, Thursday, during the Hague Congress (September 2-7). Notes are taken by Theodor Cuno, Chairman of the Investigation Commission, during the interrogation of witnesses. US: Great Sioux warrior Crazy Horse murdered. "I will return to you in stone." Crazy Horse & his starving people had peacefully surrendered to the US army on May 6th. Crazy Horse was assassinated on orders from the local Reservation Agent, bayoneted in the back by a US soldier, while in custody at Fort Robinson, Nebraska. "Tashunca Witco." New World anti-imperialist warrior hero. 1877 -- Belgium: Verviers, from the 5 to the 8 5è. Congrés of fracció Bakuninista of l'AIT.Representant the FRE (Federació Regional Espanyola de l'AIT) are Trinidad Soriano i Tomàs González Morago. 5th Congress of the Bakuninist section [anarchist] of the International Workingman's Association (IWA, the first Communist International); See also September 9 regards the Universal Socialist Congress (convened in Ghent, Belgium, intent on reunifying the various fractions within the AIT). 1882 -- US: First American Labor Day observed. 30,000 workers march in a parade sponsored by the New York City Central Labor Union. 1887 -- US: Labor Day is observed as a legal holiday in NY for the first time. 1894 -- France: A two-day rain of toads at Chalon-sur-Saone, France. 1897 -- US: Emma Goldman speaks in Boston on "Must We Become Angels to Live in an Anarchist Society?" & collects money for the victims of the Spanish authorities in the aftermath of the assassination of the premier. 1899 -- US: At the invitation of Kate Austin, Emma Goldman travels to the farming community of Caplinger Mills, Missouri, where she delivers three lectures, including "Patriotism." She had previously visited the farm of this anarchist feminist journalist in October of 1897. 1905 -- Hungary: Arthur Koestler lives, Budapest. Indicts the police state in Darkness at Noon . Hungarian born British novelist, journalist, & critic, best known for Darkness at Noon (1940), which reflects his break with the Communist Party. During the Spanish Revolution / Civil War he was captured by Franco forces, & under a sentence of death in a Seville jail. Here he experienced a mystical liberation depicted in Spanish Testament (1937). Narrowly escaping execution, in 1940 he was interned under the Vichy government. After his release he moved to England, & wrote his first book in English, The Scum of the Earth (1941), an autobiography. Facing incurable illness, & an advocate of euthanasia, Koestler took his life in 1983. 1906 -- México: Followers of the three anarquistas Flores Magón brothers, from Douglas, Arizona, try to take Agua Prieta, Sonora, to begin a revolt against Diaz (US police later arrest them). Meanwhile, campesinos of Acayucan, Veracruz form a mutual-defense pact against Diaz. 1911 -- England: Pupils desert their classrooms & parade in the streets after a Llanelli boy is punished for passing round a note urging his friends to strike against corporal punishment. In the next fortnight, schools in over 60 major towns & cities come out in solidarity. You, of all people, should know that Llanelli is in Wales, the land of song & socialism. As usual the English get all the credit. But I love the Daily Bleed . 1912 -- Anarcho-musicologist John Cage lives, Los Angeles. 1914 -- Nicanor Parra lives, San Fabián de Alico, Chile. Mathematician & often considered to be the most influential poet Chile has produced since Pablo Neruda. Self-described "antipoet," due to his distaste for standard poetic pomp & function. The poetry of the bare head. We don’t believe in nymphs or tritons. 1915 -- Switzerland: International Socialist Conference of Zimmerwald convenes, from the 5th-8th, gathering opponents of the First World War; Début d'un mouvement pacifiste international. ; amb participació of Lenin. Fou intent of refer socialisme in the heat of revolucionari world war. 1916 -- African American novelist Frank Yerby lives, Augusta, Georgia. His early story "Health Card" wins the O. Henry short story award. Turns to adventure novels & becomes a best-selling author of the 1940's & 50's. 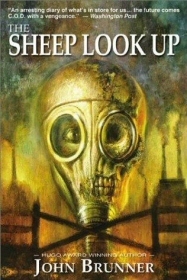 In total, Yerby publishes over 30 novels that sell over 20 million copies. 1917 -- US: Palmer raids. Federal agents attack Industrial Workers of the World (IWW) halls & offices in 48 cities across the nation. Zealously protecting free-speech & other Constitutional rights, Federal agents conduct coordinated raids, seizing records, destroying equipment & books, arresting hundreds of Wobbly activists (including "Big Bill" Haywood, a leader of the organization) for the crime of labor organizing & "obstructing" the slaughter of WWI. This is done without warrants & with total disregard for civil & legal rights. Among those arrested are Elizabeth Gurley Flynn, Arturo Giovannitti, & Carlo Tresca. Good overview & introduction to the extra-legal/anti-democratic activities & US efforts to circumvent the Constitution is Ernest Volkman's, Secret Intelligence: the Inside Story of America's Espionage Empire (1989). 1921 -- US: What's in a Name? : The Chamber of Commerce of Richmond, Virginia, petitions for the renaming of Main Street to remove the stigma aroused by Sinclair Lewis' novel Main Street . 1923 -- First use of smoke-screen for concealing troops. Military is finally catching up with politics. 1924 -- France: Emma Goldman leaves Paris for London where she hopes to find it easier to earn a living. Resides at the home of Doris Zhook. Her closest associates here include John Turner, Thomas H. Keell, & William C. Owen. 1924 -- Italy: Piero Gobetti, editore e direttore della rivista La rivoluzione liberale , viene aggredito a Torino dai fascisti. 1933 -- Cuba: Room Service? : The Sergeants' Revolt, wherein the whole Cuban military officer class is liquidated in Havana's Hotel Nacional by NCOs & enlisted troops. 1936 -- The first & most persuasive advocate of vers libre, Gustave Kahn, dies in Paris. 1936 -- Spain: 24-year-old Federico "Taino" Borrell dies. Anarquista, member of the FAI, made famous by the iconic photo "The Fallen Soldier" by Robert Capa, who captured his moment of death. Federico was buried in a shallow unmarked grave near where he fell & its whereabouts have never been traced. A militia column, "Ruescas-Taino," was named in his honor along with that of Juan Ruescas Ángel, another fallen anarchist comrade. 1939 -- Dalton Trumbo's Johnny Got His Gun published two days after the beginning of WWII. Won an American Booksellers Award for 1939. The most talented member of the "Hollywood 10," a group refusing to testify before the 1947 House Committee on Un-American Activities (HUAC) about alleged communist involvement. Trumbo was blacklisted & in 1950 spent 11 months in prison. After being blacklisted (which right-wingers, like HUAC expert-witness Ayn Rand, deny existed or happened), Trumbo was forced to write 30 scripts under 13 different pseudonyms. "What you ask is against regulations." 1954 -- England: Demo by the National Council of Tenants' & Residents' Associations, Trafalgar Square, London. (No further info given in Mace's book). 1957 -- ¶ Jack Kerouac's On the Road , an inspiration for a generation of restless spirits, is published. Regarded as the foundation text for the Beat movement, the book was written on a single scroll of paper, made up of 12-foot long sheets of tracing paper taped together & fed through a typewriter continuously, so Kerouac would not have to pause his train of thought. He wrote in fits of inspiration that lasted for days, fueled by amphetamine binges & lack of sleep. The entire process took 20 days & ended with a single spaced, 120-foot long scroll. 1958 -- Boris Pasternak's novel Doctor Zhivago is published in US for the first time. 1960 -- Leopold Sedar Senghor, poet, politician, elected President of Senegal. In 1984 he was the first black person named to the French Academy. "Listen to your blood drumming to the rhythm of the spear..."
1960 -- Cassius Clay captures the Olympic light heavyweight gold medal. Later becomes Mohammed Ali. He was stripped of his World Champion boxing crown for refusing to be inducted to fight in Vietnam, & disparaged as the worst kind of lowlife by the American government, media & corporate powers. But all ends well by the 1990s when all parties experience an epiphany continuous love-fest with the aging & ailing champ. 1964 -- Russia: Joe Hill's "Rebel Girl," Elizabeth Gurley Flynn dies, Moscow. One-time anarchist & labor militant who became a honcho in the American Communist Party. 1964 -- Manfred Mann's "Do Wah Diddy Diddy" is released. 1965 -- San Francisco Examiner writer Michael Fallon applies the term "hippie" to the SF counterculture in an article about the Blue Unicorn coffeehouse where LEMAR (Legalize Marijuana) & the Sexual Freedom League meet, & hippie houses, declares the Beat movement is alive in the Haight district. 1965 -- Labor Day opening of Martha & The Vandellas at the Fillmore Auditorium. 1969 -- Beloved & Respected Comrade Leader Attorney General John Mitchell decides not to prosecute candidates & campaign organizations who failed, in 1968, to comply with the Federal Campaign Finance Law. Some crooks are more equal than others. 1969 -- US: American Vietnam War hero Lt. William Calley is charged with murdering 109 "Oriental human beings." He too fought under television for our place in the sun. 1972 -- Germany: Black September terrorists kill two Israeli athletes at Munich Olympics as inept German police bungle their response. These Arabs demand the release of 200 Arab prisoners held by Israel. An open gun battle ensues & when the smoke cleared, the nine remaining hostages & terrorists are dead. 1972 -- Juan Puig Elias alternate spelling: Joan Puig Elias, Brasil(1898-1972) dies. Spanish teacher & militant anarcho-syndicalist. Founder of "l'Escola Natura" based on the ideas of Francisco Ferrer. A CNT activist, involved with the Council of the New School Unified (CENU) during the Spanish Revolution. 1973 -- "Many music lovers don't know that nearly a whole generation of original & highly talented musicians in Detroit were either snuffed out or forced to flee Detroit to keep their music careers alive. You'd come into a studio, cut a record, & they'd pay you maybe $20 & a bottle of whiskey. It didn't matter if the records sold 10 copies or if they sold 10,000." 1975 -- US: So, What's Yer Point? Masonite Lynette Alice "Squeaky" Fromme, a member of Charles Manson's "family," is caught pointing a handgun at Beloved & Respected Comrade Leader President Gerald "Chewing Gum" Ford in Sacramento, California. Near miss by the young miss. 1978 -- US: Unexplained green slime falls on Washington, DC (-Sept. 6). What's to explain, you ask? Politicians dripping uncontrollably all over themselves. 1978 -- Australia: Queensland premier bans all political street marches. 1981 -- England: Greenham Common Women's Peace Camp established outside Greenham Air Base as "Women For Life On Earth." 1986 -- US: NASA launches GOD-1. Other Gods to follow? 1986 -- France: Maurice Pernette lives. Anarchiste, small press publisher, author. http://www.la-presse-anarchiste.net/article.php3?id_article=617 SADE, MARQUIS DE.. Dorci ou la bizarrie du sort suivi de Dialogue entre un pretre et un moribond. Avec une notice sur l'auteur. Paris. Plaisirs aux lettres. Maurice Pernette. 1957. 12°. 94pp. Or.wrappers. Text spine faded. Browned. Unopend One page tear. 2 illustr. EUR 22.00 = appr. US$ 27.28 Lucien Jean. Preface De Henry Poulaille, Bois De Jean Lebedeff Lanoizelee, Louis Paris, Maurice Pernette Livre Meilleur prix : 20,00 € Poèmes condamnés. BAudelaire (Avant-propos de Maurice Pernette). Imp. du Cantal. Paris : Plaisir du bibliophile, 1950. Guide général de la poésie française présente / mis en ordre par Roger Bellanger et Maurice Pernette, avec la collaboration de Jean L'Anselme ... [et al.] Lucien Jean. Preface De Henry Poulaille, Bois De Jean Lebedeff Paris, Maurice Pernette, Plaisir du Bibliophile, 1952. Contient en plus une belle photographie de Jean Lucien + quelques extraits de journaux le concernant. "As I lay on the floor in the dark, empty room," she says, "Tuppins, my puppy, licked at the tears running down my face, Oh, Tuppins, I sobbed. Why has god forsaken me?" Tuppins told her to "piss off" before keeling over dead, from toxic shock, after sucking up all that dribbling mascara. 1989 -- US: Beloved & Respected Comrade President George Bush I announces a $7.9-billion anti-drug plan; George uses a bag of crack purchased across the street from the White House as a prop to show how ubiquitous drugs are (later it is revealed that DEA agents had to lure a drug dealer there). Why he didn't score the crack from his drug-using son, George II, is not known. 1990 -- US: Los Angeles police chief Darryl Gates testifies before the US Senate that "casual drug users should be taken out & shot." See 1989 above. 1990 -- US: Trainites set fire to a restaurant when unable to obtain items listed on the menu. 1990 -- US: Greenpeace activists in Seattle chain themselves to a barge carrying chlorine to Alaska. 1991 -- US: Energy Department says some US nuclear-weapons plants will remain contaminated for 100 years despite a massive clean-up effort. 1991 -- US: AIDS activists inflate a 15' condom on the roof of Beloved & Respected Comrade Leader Senator Jesse Helms' Virginia home. Should have put it on his head. "Fits like a glove!" "All we know is that, as we understand the doctrine of salvation, a lot of people are lost." 1997 -- Cuba: Dissident Hector Palacio Ruiz sentenced to 18 months in prison on a charge of "disrespect for authority," having dissed Beloved & Respected Comrade Leader President Fidel Castro in a German television interview. Palacio, in an interview broadcast last December on German TV, strongly criticized Castro's rule, calling for reforms, & at one point calling Castro "crazy." 1997 -- John Sayles movie "Men With Guns" premiers, Toronto Film Festival. Sayles is also a short story writer & novelist ( The Anarchist Convention, Union Dues, Los Gusanos , etc.). 1999 -- East Timor: Anti-independence armed thugs take over the country. 1999 -- Palestinian terrorists are killed when their time bombs explode one hour prematurely, due to a daylight-savings time change. 2001 -- Human Rights Watch charges Macedonia with abuses against Albanians. 2001 -- Perú: Murder charges are filed against exiled ex-dictator Alberto Fujimori. 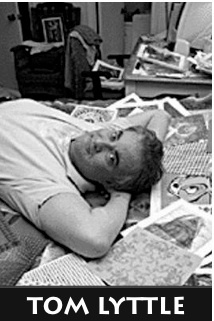 2008 -- Psychedelics researcher, blotter artist Tom Lyttle dies, Fort Lauderdale, Florida. Pasted postage stamps all over himself to avoid arrest since he was First-Class Mail. Cybernaut author, publisher, gourmet chef, conspiritologist. If there are to be laws, we need ones that Begin with the acceptance of poverty as a way of life. We must make the world safe for poverty Without dependence on government. "Three-fourths of philosophy & literature is the talk of people trying to convince themselves that they really like the cage they were tricked into entering."